You can add a new storage volume to your VM at any time. These volumes have the type DATADISK. They can be resized, and data protection services are available. Please check the VDC 2.0 Technical Data Sheet for current operational limits on disk size and performance, and the number of volumes that can be attached to one VM. This document describes how to create a new datadisk volume, and attach it to a virtual machine. If you are using the API, see the document: VDC API: How to create and manage storage volumes. Login to the Control Centre and click Storage on the left-hand menu. Make sure the Select view drop-down is set to Volumes. A Name for the new volume is required. 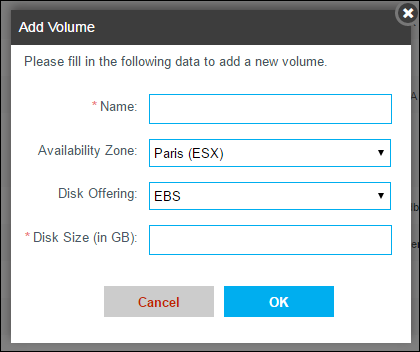 Set the Availability Zone to be the same as the zone of the VM to which the volume will be attached. Choose the Disk Offering: there is a choice of magnetic disk storage ('EBS') or SSD storage ('EBS SSD') and there are three tiers of data protection: unprotected (the options 'EBS' or 'EBS SSD'), without any backup of the disk contents; Protected, which has automatic backup of the disk inside the same VDC zone; and Mirrored, which has dual automatic backup in the same VDC zone and a remote VDC zone. Type in the Disk Size, in units of Gigabytes. The minimum size available is 10 GB, and the maximum size available is 2000 GB. Click the OK button to perform the volume creation. A newly-created volume is not attached to any VM; see the next section to continue with that. The minimum IOPS settings currently available are: 2000, 3000, 4000, 5000, 6000, 7000, 8000, 9000, 10000 IOPS. 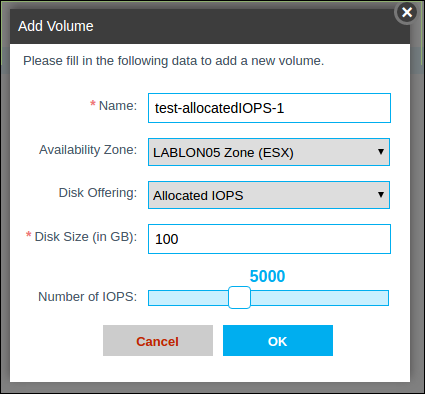 For further details about Allocated IOPS, see the Allocated IOPS Data Sheet. Magnetic and SSD storage are offered at the same price, and simply charged per gigabyte per hour. The per-gigabyte rates are higher for Protected and Mirrored storage types, to cover the costs of additional data storage. There are no other charges for these data protection services. Allocated IOPS volumes have an additional charge per IOPS per hour. Please see VDC Pricing for the current prices. Note that all of the storage offerings provide inclusive RAID-based duplication for High Availability. You can attach (or detach) volumes to a VM at any time. It is not necessary (for VDC) to stop a VM to attach/detach a volume, however it is usually necessary to re-start a VM so that the operating system correctly detects the attached or removed disk. Detaching requires un-mounting the drive in the operating system so that any pending disk operations are completed. In the Storage view, click the volume name in the list of volumes and click the Attach disk button . 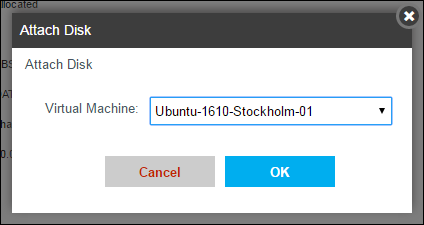 Choose the VM you want to attach to, and click OK. The changed status for the volume will be shown by the VM details appearing in the VM ID, VM display name and VM state fields. For an attached volume, the 'attach' button changes to a Detach disk button . For Linux VMs, you should always re-start the VM after attaching a disk, so that the operating system will recognise the new disk. A new storage volume will appear to the VM operating system as an unformatted drive, and it will need to be partitioned, formatted, and mounted by the operating system before use. A formatted drive retains its state and data contents whether it is attached or detached in VDC, and must be mounted by the operating system each time it is attached to a VM.